This image depicts a Grand Ball in 1869. 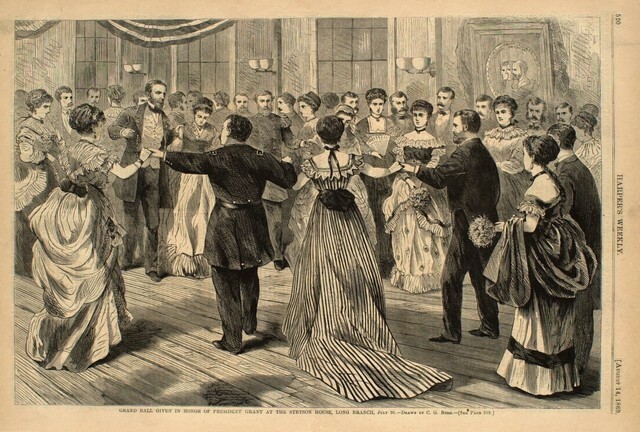 Although the parties and balls that Peabody attended might not be this grand, the general idea of dancing and socializing is shown. Balls and parties were regarded as exciting social events. For Peabody, going to a ball was a time for him to be able to take a break from his daily tasks and socialize with friends. Peabody went to a significant number of balls in the wintertime. On, January 1, 1851 Peabody states “A. McIntyre, John Freeman and I went over to Kinney’s Corners to a ball this evening. There were about 50”, showing that events like the New Year were celebrated by having large parties. In the following year, 1852, Peabody also attends a ball on January 1. Peabody writes: “There is a ball over to J. Higgins this evening”, this entry makes it apparent that the New Year’s Day Ball was a common event in Peabody’s life. Most balls that took place during this time were holiday related and a time to celebrate. It can be inferred that Peabody enjoyed attending these events and looked forward to the social aspect. Since Peabody was very involved in the community, attending meetings and other events, as well as staying connected with a plethora of people, balls were a time when he could experience more casual socialization. He usually brings some friends with him to the parties or mentions seeing close friends at the party. Peabody was a well-connected gentleman and valued the social aspects that these balls provided. Most meetings that he attended were about political and religious concepts, so the balls and parties were an event that was more orientated toward social connections and relationships; a time to catch up with friends and just have a nice time. Peabody attended mainly attended balls after Christmas Day. However on Christmas Day 1850 Peabody writes: “It is Christmas Day. There is a party down to W. Bryant’s in the valley. I took Evaline and Ellen and went to M. Coykendall’s in Canadice”. It can be assumed that Peabody was attending a Christmas party, following the tradition of spending Christmas day with his closest friends and family. It seems that even during the time period in which Peabody lived there was a ‘holiday season’ where people were able to take a bit of a break and just enjoy the company of friends and family. The balls could be considered to be a social event of the holiday season and one can imagine the excitement in the air as Peabody and others pulled up to the location of the ball in sleighs. It would have been such an exciting and enjoyable event for everyone. In comparison to attending a holiday party today, Peabody attended balls to celebrate friends, family, and all of the great relationships he had in his life.